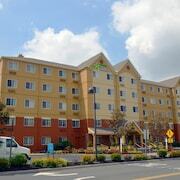 Within 2 miles of Giants Stadium and Meadowlands Convention Center, this Meadowlands area motel is 6.5 miles from Manhattan. Ski spots near New York City. Opens in a new window. Haunted New York City. Opens in a new window. Family beach weekend near New York. Opens in a new window. 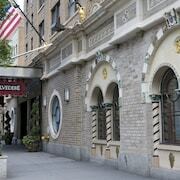 Family getaways near New York City. Opens in a new window. 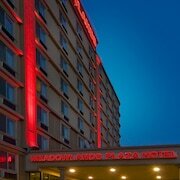 Which hotels are closest to the Secaucus airport? 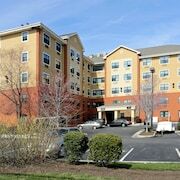 Where to stay near top Secaucus attractions? What kind of hotels are in Secaucus? 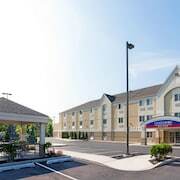 Which hotel chains are in Secaucus? Travelers to Secaucus give high marks for the shopping, top-notch restaurants, and entertainment choices. This welcoming city also attracts tourists with its riverfront. Penn Station, Broadway, and Times Square are some of the top sights around the area. The city's natural setting is picturesque, including the riverfront and Riverbend Wetlands Preserve. The city is well liked for its places to shop, and Mill Creek Mall is a favorite for retail therapy. A couple of additional sights to add to your agenda are Meadowlands Exposition Center and Field Station Dinosaurs. 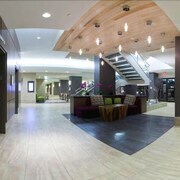 Residence Inn Secaucus Meadowlands - This 3-star hotel features free breakfast, an indoor pool, and free WiFi. 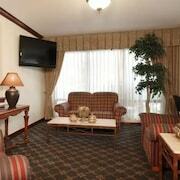 It's a favorite with Expedia travelers for its family-friendly amenities and convenient parking. 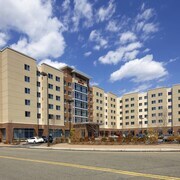 Hyatt Place Secaucus/Meadowlands - Our customers like the family-friendly amenities and clean, quiet rooms at this hotel. 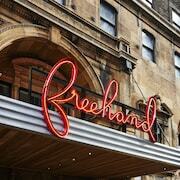 This 3-star hotel features free breakfast, free WiFi, and free parking. 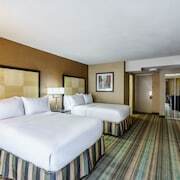 Hilton Garden Inn Secaucus/Meadowlands - With a stay at this 3-star hotel, guests can enjoy access to a restaurant and an indoor pool, along with free WiFi. Expedia customers like its breakfast and convenient parking. 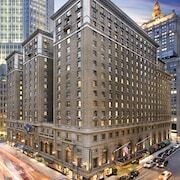 Popular places to visit in the area include Penn Station, located 4.2 mi (6.8 from the city center, and Broadway, which is 4.3 mi (6.9 away. If you want to explore the larger area, ride aboard one of the trains from Frank R. Lautenberg Secaucus Station. Secaucus might not have many public transportation choices so consider renting a car to explore the city. 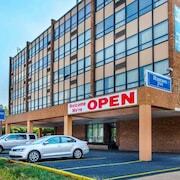 What are the most popular hotels in Secaucus? 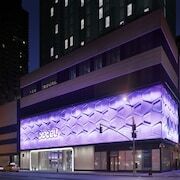 Are there hotels in cities near Secaucus? Explore Secaucus with Expedia.com.au’s Travel Guides to find the best flights, cars, holiday packages and more!